Surface to Air missile kits in 1:72-1:76....can anyone help??? I have a keen interest in Surface to Air missile systems. Does anyone know who makes the best kits of these? I know of the SA-2 from Maquette/Gran/Airfix, the MW kits and the SA-10 from PST.. but what about others?? In Resin?? I am personally interested in the SA-4 Ganef with Transporter, SA-3 Goa with Transporter and SA-5 Gammon with Transporter. Also the ZSU-57-2 is quite interesting....can anyone help?? Ace makes a ZU-23 gun system in 1/72. 5 Star Models makes a SA-6, a 2S6 "Tunguska" air defense system, but in 1/35th. They used to make an SA-4 in 35th, but that's about all I can think of. The SA-2 is I think the most readily available kit of a soviet SAM in 1/72nd. Airfix made the SAM dont know if they still do. But if i do will let you know . Sorry i could not be anymore help. ACE also makes an SA-13 Gopher and LAV-AD in 1/72 scale. I would like to see more SAM's in 1/72 especially American and Idf. I wanted a 1/72 Nike Hercules so I had to scratchbuild it. Scratchbuilding the missles is a good scratchbuilding project. All you need are some decent drawings and the right tubes (some of the Idf missles are very simple). The launchers and vehicles are another story though. Im not too firmilar with the names of the US and IDF missile systems. Care you drop me a few names? Can't hepl you on this one but Trumpeter are due to release an excellent SA 6 in 1/35th hopefully sometime in October. I like the HAWK system and especially it's triple launcher. It might be a future project for me. Quite impressive....who makes kits of those u mentioned in 1:72-1:76? What do u usually build in any scale?? Thats the problem. Nobody makes these kits and I doubt they will every be made. They have to be scratchbuilt. Sometimes the launchers can be cobbled and kitbashed together from other kits. I build almost all braille scale. I have some 1/35 and 1/76 though. So in the end, in which scales do any of these missile kits exist, ICBM or otherwise? 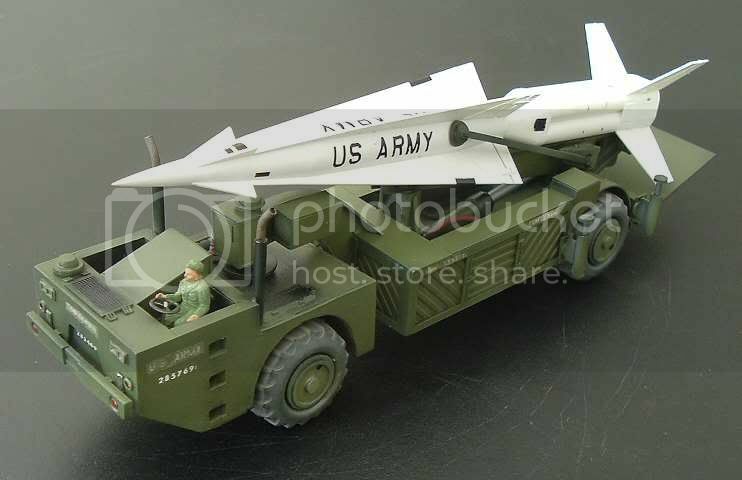 I actually have a kit of a few soviet and US ICBM;s in 1:144 made by monogram in the 1980s....do u know of it? ?